"Co-" stands for "controlled" and "-blation" is from the word, "ablation," which is the process of reducing the size of something; when the sun melts an iceberg, the process is called, "ablation." COBLATION technology combines radiofrequency energy and saline to create a plasma field. The plasma field remains at a relatively low temperature as it precisely ablates the targeted tonsil tissue. 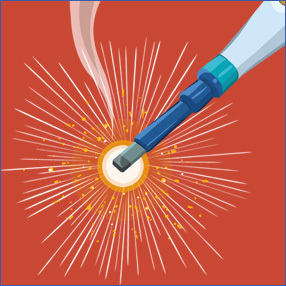 The COBLATION plasma field removes target tissue while minimizing damage to surrounding areas. What is a COBLATION Tonsillectomy? A COBLATION tonsillectomy is the use of a COBLATION wand to remove the tonsils. Why was COBLATION tonsillectomy developed? Surgeons and patients alike have searched for years for a better way to remove the tonsils. Because the tonsils are located in the throat, removing them with an electrosurgery device can often lead to painful damage of nearby tissue. 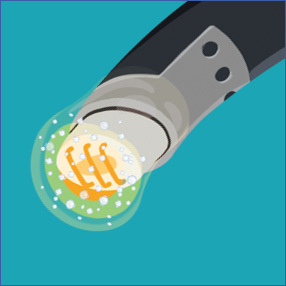 COBLATION technology offered an alternative to high-heat electrosurgery. How is a COBLATION tonsillectomy different from a standard tonsillectomy? Unlike the electrosurgery procedure, a COBLATION tonsillectomy generates significantly lower temperatures on contacted tissue*. This gives surgeons the ability to precisely remove targeted tonsil tissue while preserving the nearby healthy tissue. 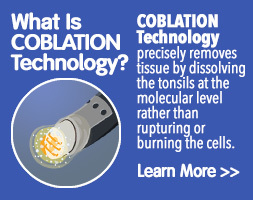 COBLATION technology precisely removes tissue by dissolving the tonsils at the molecular level rather than rupturing or burning the cells. 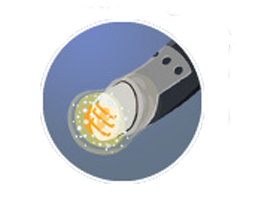 COBLATION technology combines low-temperature radiofrequency energy with saline to create a plasma field. This plasma field is contained at the tip of the device and dissolves tissues molecule by molecule, resulting in a precise dissection of targeted tissue. The COBLATION process generates significantly lower temperatures on the contact tissue therefore minimizing damage to the surrounding healthy tissue. 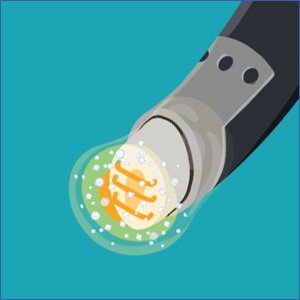 Electrosurgery generates very high temperatures by applying high-voltage energy directly to the tissue. This high heat energy is used to rupture cells and vaporize tissue. Further, this heat energy is transferred to surrounding tissues which may cause significant damage such as burning and charring. *Roy S, Smith LP. Device-related risk of fire in oropharyngeal surgery: a mechanical model. Am J Otolaryngol 2010;31:356-9.